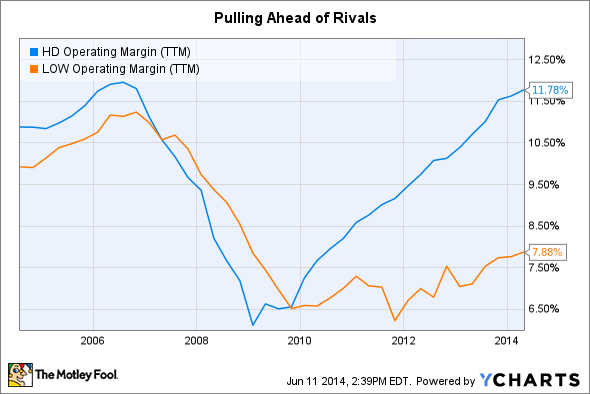 This retailer is losing to the market so far in 2014 -- but that could change in a big way. Home Depot (NYSE:HD) stock is trailing the market so far in 2014, down about 3% versus the Dow's 2% rise. But that trend is set to change, Fool contributor Demitrios Kalogeropoulos argues in the video below. Demitrios highlights three numbers from the retailer's latest earnings results that all point to solid returns ahead for the stock. First, Home Depot's profitability has doubled over the past five years, and its operating margin continues to pull away from rival Lowe's (NYSE:LOW). Beyond that, the home improvement giant has made a point of returning billions of dollars to shareholders in the form of stock repurchases. Home Depot spent $1.25 billion last quarter on its shares, which helped EPS jump higher by 20% despite just a 3% overall sales boost. And finally, Demitrios highlights the company's stellar return on invested capital, which hit 20% last quarter and should climb as high as 27% next year. Watch the video below for Demitrios' full take.